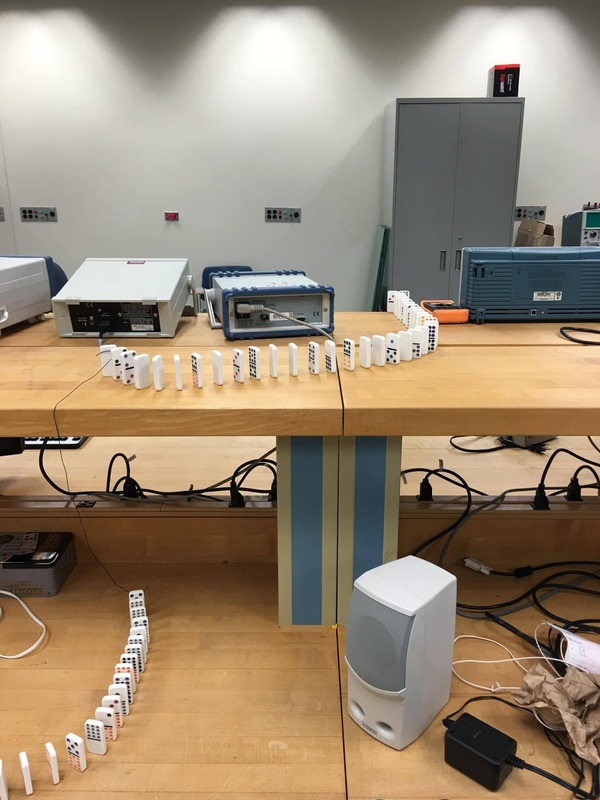 When it comes to using dominoes it is very easy to fail and knock them over. It happened to me a few times and also when the dominoes had to fall off the edge shown in my first video, the domino path didn't continue. Other failures involved the circuit with not putting in the correct resistor values to create the desired gain for the op amp. Also the resistor values for the transistor were off making the motor spin very slow and not hitting the domino over. David, I hope your dominos will work fine. Your circuit is very similar (if not the same) as some of our labs. I like 7 segment saying hello but you might want to find a way to maybe trigger in a different way? Also, this part is not included in your drawing. I will just have to be prepared early and have the dominoes very close and just put a bunch on the other side for the fall to make sure it works. 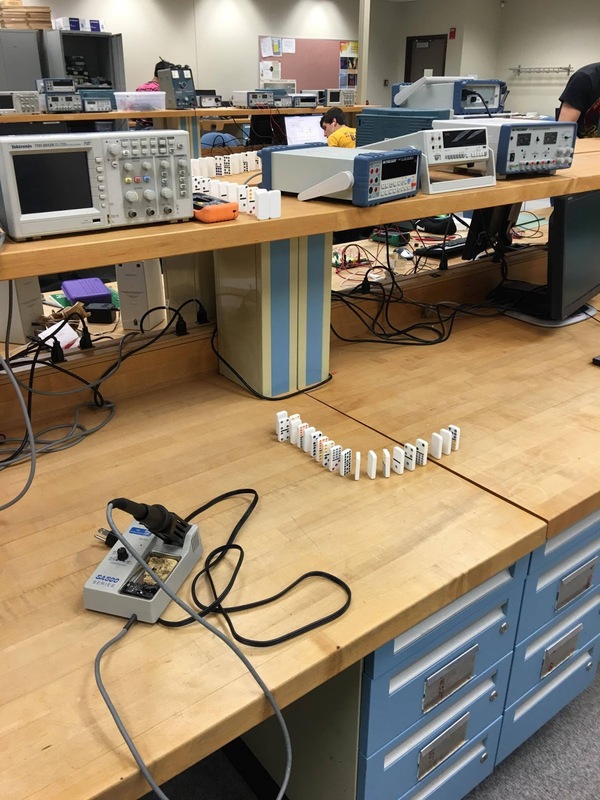 I like your setup, and I always enjoy watching dominoes tumble over. How do you connect the dominoes on different levels? Is it just connected by string taped to each corresponding domino? If so does the tape hold? For my transistor I ended up using a very small (87 ohm) resistor for the collector and no resistor between my OpAmp and base, this gave me enough voltage to get my motor to run. 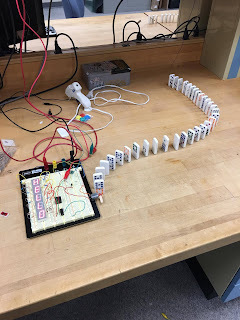 I connected the dominoes with a string thats super glued to it to make sure it doesn't come off and seems to work every time. I had to add additions to my circuit to get the voltage from nick by using a sensor going to the op amp that will switch over the relay. From there the motor will start. 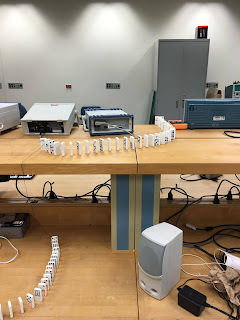 I like the setup, nice idea to use the string glued to the dominoes to do the level change. Hey David, I think the 7 segment display is unique since no one has really done anything with them other than counting or displaying single letters. I have a suggestion for you input to your RB setup. If you do not know how you will get a voltage from the previous person you could always use a senor of some sort to trigger the start of yours. I think these are great ways to transition and make the entire setup interesting. If we all just had a power incoming from the previous circuit it would seem like we just have a bunch of circuits connected together without the mechanical movements. Hopefully your dominoes work out okay! Maybe use a strain gauge or something for the voltage? 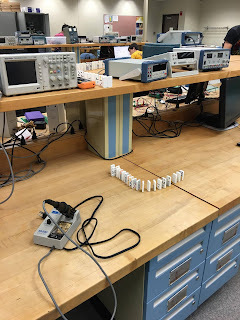 Why not just connect it to the function generator or the power supply?